For other uses, see Theophilus. Although the original documents of the council have not survived, several versions of the list of bishops at Nicaea have been preserved. British Library owns a 6th-century manuscript of Antiochene Synodicon (BL Add. 14528, ff. 1r–151v), collection of Syriac translations of records from several councils, including a list of 220 Nicaean bishops, among them "Theophilus of Gothia". Another gothic bishop that attended the council was Cadmus of Bosporus, from the Crimea. The bishops of Gothia were likely under the bishop of Constantinople's jurisdiction. Theophilus ministered to communities of Gothic Christians, in either the area west of the Black Sea and along the lower Danube, according to most scholars, or in Crimea (on the northern coast of the Black Sea). According to the "Ecclesiastical History" in Nicene and Post-Nicene Fathers, one of Theophilus' disciples was the Gothic bishop Ulfilas, and since Ulfilas was among the Western Goths, this supports the position that Theophilus was from the area of the lower Danube, west of the Black Sea, with the bishop's seat at Tomi. 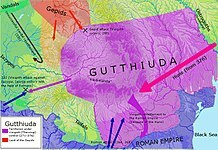 The Danube Goths, or Visigoths, were mostly pagans until Audius and Ulfilas spread the concept of Arianism in the 4th century, converting them to Christianity. He was succeeded as bishop by Ulfilas. Another disciple of Theophilus was Saint Nicetas the Goth, whose eulogy included "The sainted martyr of Christ, Nicetas, lived in the reign of the Great Tsar Constantine; he was a Goth by origin, from those who lived on the river Danube. Being pious and fearing God, and living in the city of Gatan, he was instructed in the Christian faith by Theophilus, the reverend bishop of Gothia." In Lectures on the History of the Eastern Church (1872) described Theophilus as a light-skinned man from the extreme north, among the "tawny hue and dark hair of all the rest." ^ Sara Parvis (2014). "Was Ulfila Really a Homoian?". Arianism: Roman Heresy and Barbarian Creed. Ashgate Publishing. pp. 56–57. ^ Simek, Rudolf (2003). Religion und Mythologie der Germanen. Darmstadt: Wiss. Buchges. ISBN 978-3534169108. ^ a b Natalia Smelova (2016). "The Canons of the First Ecumenical Council of Nicaea in the Manuscript IOM, RAS Syr. 341" (PDF). Written Monuments of the Orient. 3 (1): 45–46, 51. Retrieved 27 February 2017. ^ David A. Michelson (2014). The Practical Christology of Philoxenos of Mabbug. Oxford University Press. p. 115. ISBN 9780191034497. ^ Benjamin Harris Cowper (1861). Syriac Miscellanies: Or, Extracts Relating to the First and Second General Councils, and Various Other Quotations, Theological, Historical and Classical, Tr. Into English from Mss. in the British Museum and Imperial Library of Paris, with Notes. Williams and Norgate. pp. 13, 30. ^ a b c Ralph W. Mathisen (1997). "Barbarian Bishops and the Churches 'in Barbaricis Gentibus' During Late Antiquity—The Bishops of the Crimean and Danubian Goths". Speculum. 72 (3): 670. JSTOR 3040758. The first reference to bishops of the Goths are associated with the area of the Black Sea. In 325 the Council of Nicaea was attended by the bishops "Cadmus of Bosporus" and "Theophilus of Gothia"… The location of Gothia is unclear… "Gothia" and "Scythia" could refer either to Crimea of to the left side of the lower Danube. ^ Benjamin Harris Cowper (1857). Analecta Nicaena: Fragments Relating to the Council of Nice: The Syriac Text from an Ancient Ms. in the British Museum. Williams and Norgate. p. 27. ^ Ralph W. Mathisen (1997). "Barbarian Bishops and the Churches 'in Barbaricis Gentibus' During Late Antiquity—The Bishops of the Crimean and Danubian Goths". Speculum. 72 (3): 671. JSTOR 3040758. John Chrysostom, bishop of Constantinople 398–404, consecrated another bishop of Gothia, Unila. Subsequently, when Chrysostom was in exile in 404, he expressed worry that Unila's successor would be consecrated by his, Chrysostom's, Constantinoplitan rival Arsacius. This would lead one to conclude not only that these Gothic bishops were Nicene, but also that they were under the jurisdiction of the bishop of Constantinople. ^ a b Richard A. Fletcher (1999). The Barbarian Conversion: From Paganism to Christianity. University of California Press. p. 76. ISBN 978-0-520-21859-8. ^ Vasiliev 1936, pp. 14,17. ^ E.A. Thompson (November 27, 2008). 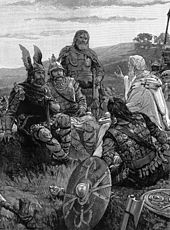 The Visigoths in the Time of Ulfila. Bloomsbury Academic. p. 9. ISBN 978-0-7156-3700-5. ^ Philip Schaff (June 1, 2007). Nicene and Post-Nicene Fathers: Second Series Volume II Socrates, Sozomenus. Cosimo, Inc. p. 72. ISBN 978-1-60206-510-9. ^ Vasiliev 1936, pp. 17–18. ^ Thompson, E. A. (April 1956). "The Date of the Conversion of the Visigoths". The Journal of Ecclesiastical History. 7 (1): 1–11. doi:10.1017/S0022046900071463. ISSN 1469-7637. ^ Vasiliev 1936, p. 37. ^ Vasiliev 1936, p. 18. ^ Vasiliev 1936, p. 19. ^ Arthur Penrhyn Stanley (1872). Lectures on the History of the Eastern Church. Scribner. p. 201. Alexander A. Vasiliev (1936). The Goths in Crimea. Cambridge, Massachusetts: The Mediaeval Academy of America. This page was last edited on 7 July 2018, at 23:44 (UTC).